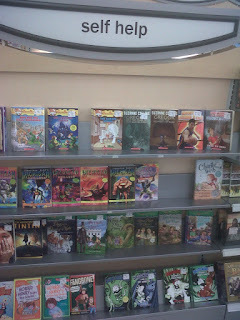 I took these photos in the book department at our local Meijer's store. Although it did give me a chuckle, I am not sure I want the kind of "self-help" that Captain Underpants might supply. Nor do I think Michigan Chillers is going to get anyone on the right track in their lives. But it reminds me that we need to always keep an eye on our merchandising and signage. 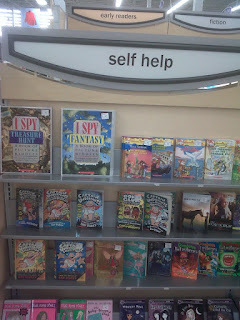 This display sent me a strong signal that the book department would have no rhyme nor reason and that signs in this store were not to be trusted. Neither are good messages to send you customers. Take a good, solid look around your store for signs that are misplaced or misused. Some of your signs have been there so long they have faded into the woodwork for you. Count and document each sign. You will be surprised how many signs you find out of place, expired, or just needing to be freshened up. PS Signs sell! Rick Segal claims they increase sales of a product by 43%. But make sure you do them right. Horrible signs, old signs, and signs in the wrong place can send the wrong message and ultimately hurt your sales.